These attractive, modern and affordable "A" Grade panel systems let you achieve the first-class, professional image you require. Our complete 4-Person Cluster Cubicles feature technology-friendly cable raceways through both the base and middle of panels to completely organize and declutter your workstations. Top notch styling cues include silver metal frames, tempered glass windows with frosted striping and neutral fabric with choice of four laminate finishes. Quick and easy set up with unique clip together assembly system. 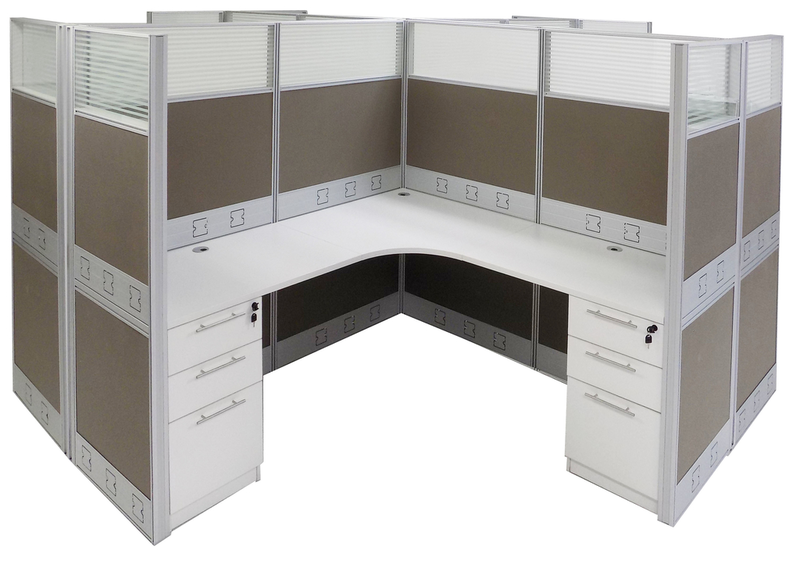 Complete 12'W x 12'D x 48"H Double Raceway 4-Person Cluster Cubicle w/Drawers sold above. See 67"H 4-Person Cluster Cubicle below. 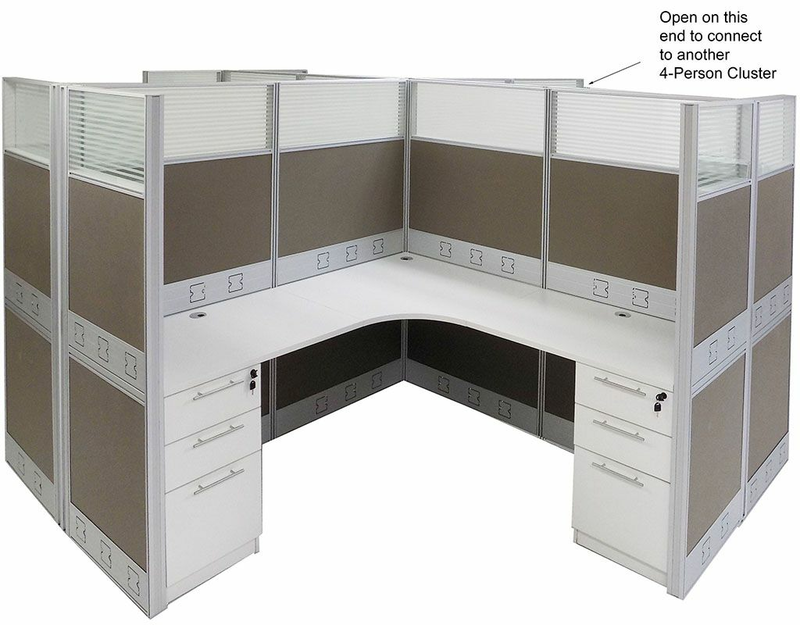 48"H 4-Person Cluster Cubicle includes all 48" high panels with tempered glass windows, connecting posts, worksurfaces (four corner and eight 24"x36" rectangular), locking box/box/file drawer units (eight) and necessary hardware for four complete workstations clustered together as shown. Overall dimensions including panels measures 150-3/4"W x 150-3/4"D x 48"H. Shipping weight 1398 lbs. PRICE INCLUDES SHIPPING! (Truck shipment - See Terms & Conditions). IN STOCK! * See Our Video. Simple universal assembly system for installation by anyone. Panels clip together with universal post system. 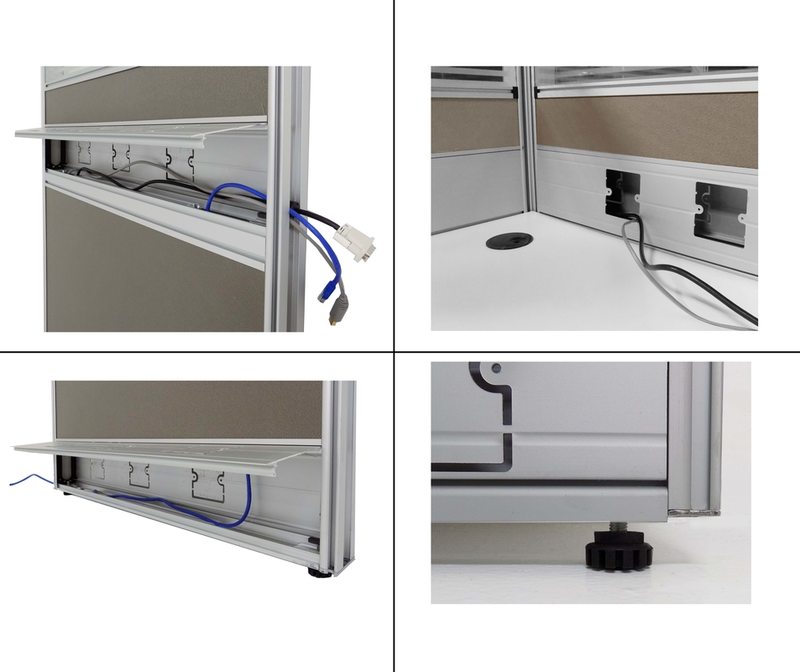 * Double raceway design allows cords and cables to route through bottom or above desk work surface in middle of office panel and even down connection posts for complete cable connectivity! * Punch-outs in raceway panels for electrical/data outlets (Electrical not included. Must be supplied and installed by electrician). 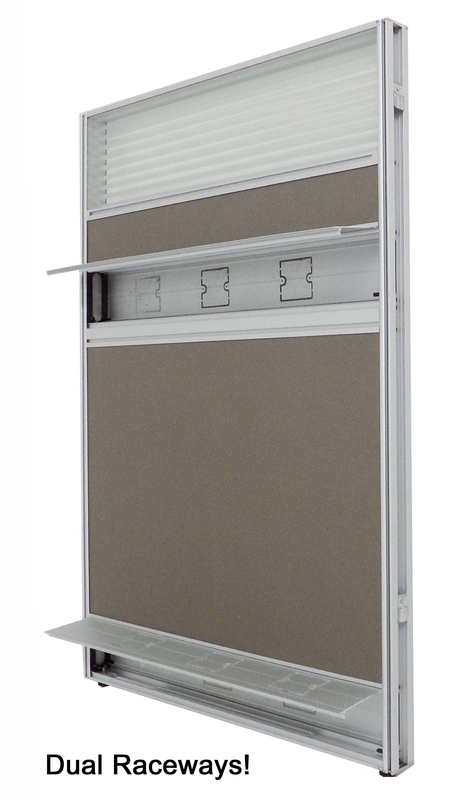 * Superior metal frame construction creates a solid and stable office panel system. Strong enough to easily support work surfaces in metal frame channels. 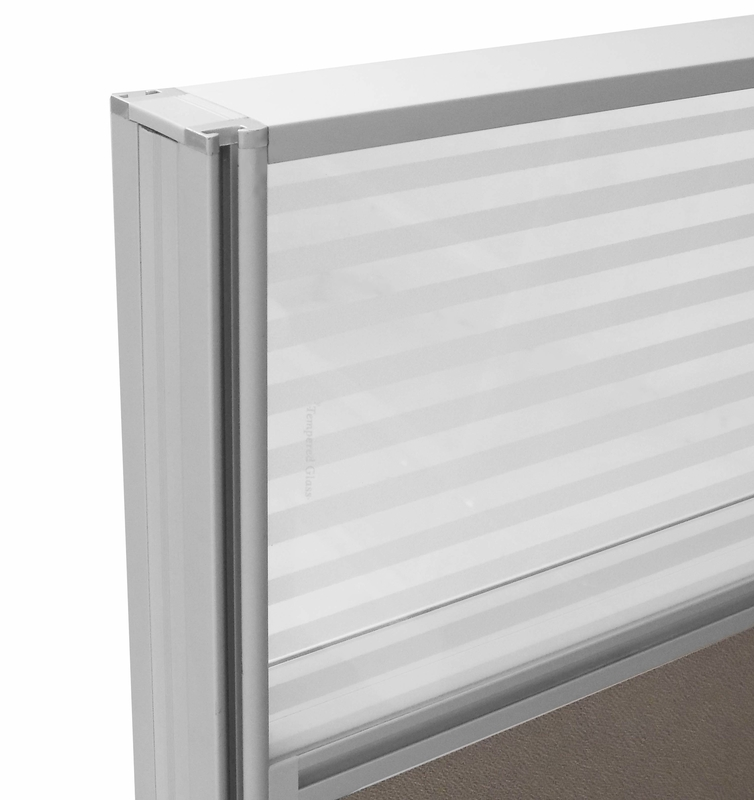 * Flip up metal raceway covers conceal cable troughs measuring 2"D x 4"H. Panel end and connector post raceway openings are 7/8"D x 3-3/4"H.
* Tempered glass window at top with frosted stripe design provides upscale and open appearance. * Neutral Taupe fabric color with Silver frame works well with almost any color scheme in your office. * Durable laminated worksurfaces with tough edge band design for busy offices. * Worksurface mounts firmly into panel frames with simple clip-in mounting brackets provided. * Each cubicle includes two locking box/box/file drawer units. Drawers ship assembled. * Laminate choice of White, Mocha, Maple, Cherry, Charcoal Modern Walnut to coordinate in any office. * Office panels are a full 2-1/4" thick for an impressive and substantial appearance! 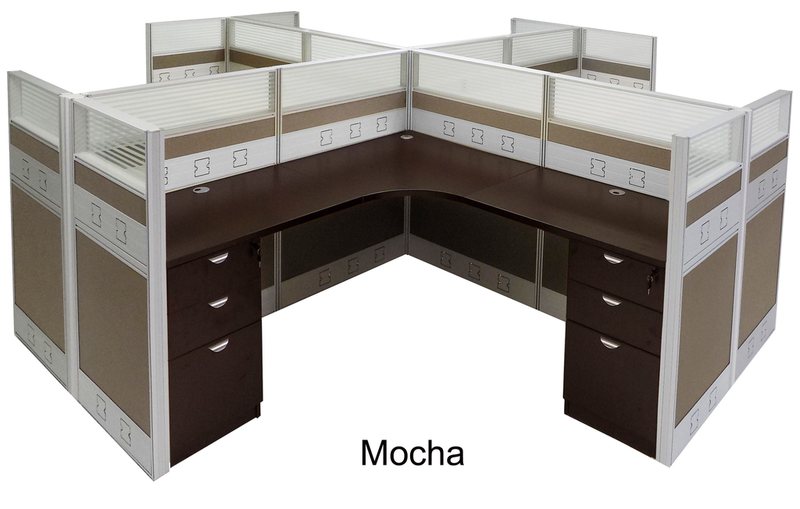 * Cubicles available in two heights: 48" high or 67" high. * Panel core features a rigid engineered wood frame with a hardboard core. Panels are non-tackable and non-powered. * Features a simple in-line connection system requiring no additional hardware. Easy set-up requires no special training or instruction. * Universal Connection Post allows easy 90 degree, 3-way or 4-way connections between panels. Can even be connected between 48" high and 67" high panels. * Optional Electric Lift Height Adjustable Table Base sold at bottom of page allows you to easily turn your corner worksurface into a height adjustable corner desk! 3 - 9 $5,049.00 ea. 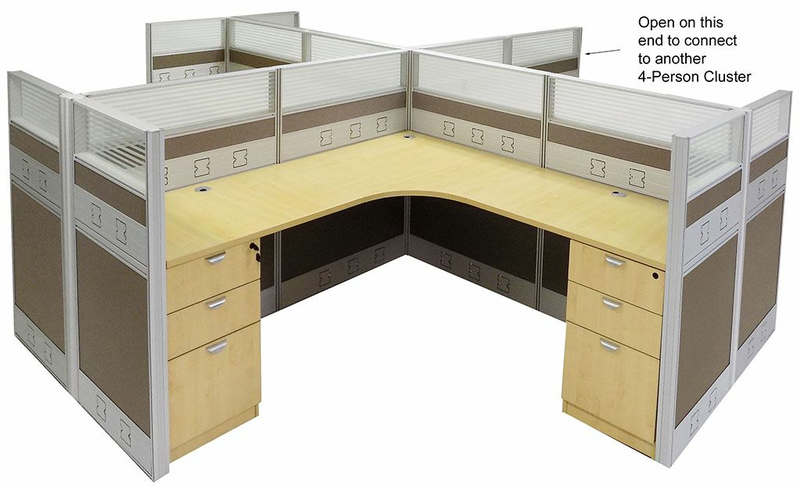 Use this workstation to add/connect to an existing 4-Person Premium Cluster 48"H Cubicle. This workstation is just like Y11902 but without two 24"W panels and connector one side, for adding on cluster workstations in a row. Cubicle features 48" high Double Raceway Premium panels with glass windows, four connecting posts, worksurfaces, four locking box/box/file drawer units and all necessary hardware as shown. Outer cubicle dimensions are 150-3/4"W x 148-1/2"D x 48"H. Shipping weight 1343 lbs. PRICE INCLUDES SHIPPING! (Truck shipment - See Terms & Conditions). IN STOCK! 1 - 2 $6,799.00 ea. 3 - 9 $6,499.00 ea. 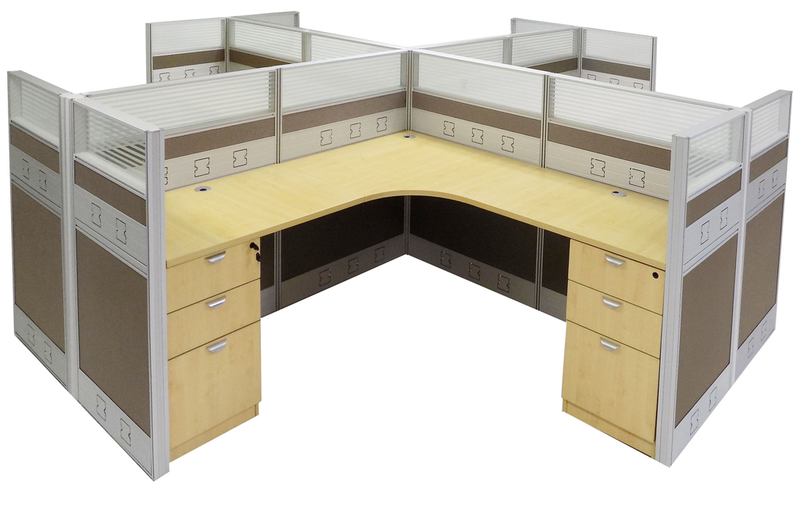 67"H 4-Person Cluster Cubicle includes all 67" high panels with tempered glass windows, connecting posts, worksurfaces (four corner and eight 24"x36" rectangular), locking box/box/file drawer units (eight) and necessary hardware for four complete workstations clustered together as shown. 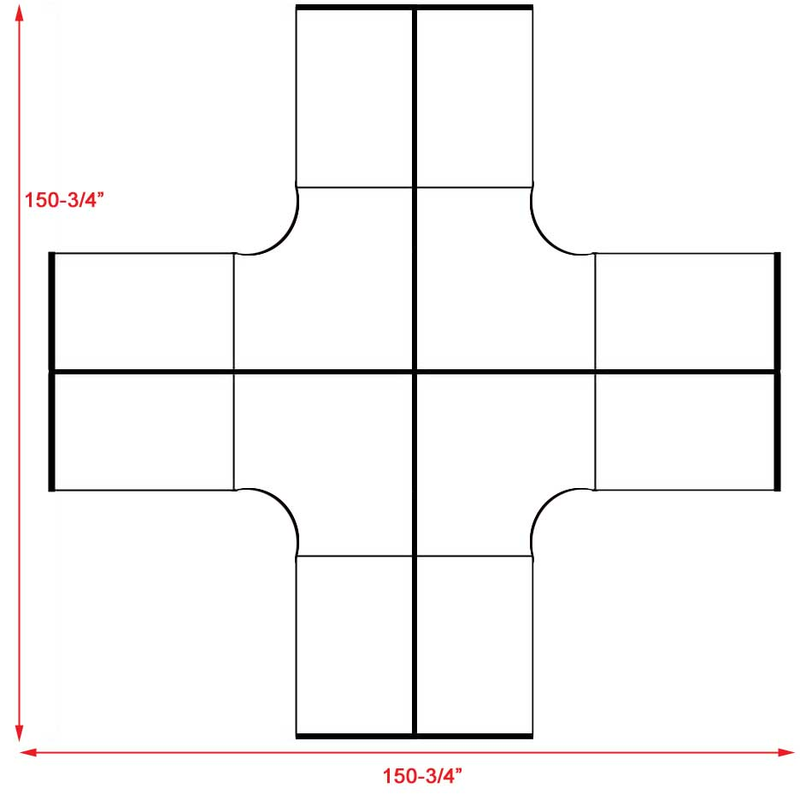 Overall dimensions including panels measures 150-3/4"W x 150-3/4"D x 67"H. Shipping weight 1574 lbs. PRICE INCLUDES SHIPPING! (Truck shipment - See Terms & Conditions). IN STOCK! 1 - 2 $6,499.00 ea. 3 - 9 $6,199.00 ea. Use this workstation to add/connect to an existing 4-Person Premium Cluster 67"H Cubicle. This workstation is just like Y11903 but without two 24"W panels and connector one side, for adding on cluster workstations in a row. Cubicle features 67" high Double Raceway Premium panels with glass windows, four connecting posts, worksurfaces, four locking box/box/file drawer units and all necessary hardware as shown. Outer cubicle dimensions are 150-3/4"W x 148-1/2"D x 67"H. Shipping weight 1499 lbs. PRICE INCLUDES SHIPPING! (Truck shipment - See Terms & Conditions). IN STOCK! 3 - 9 $289.00 ea. 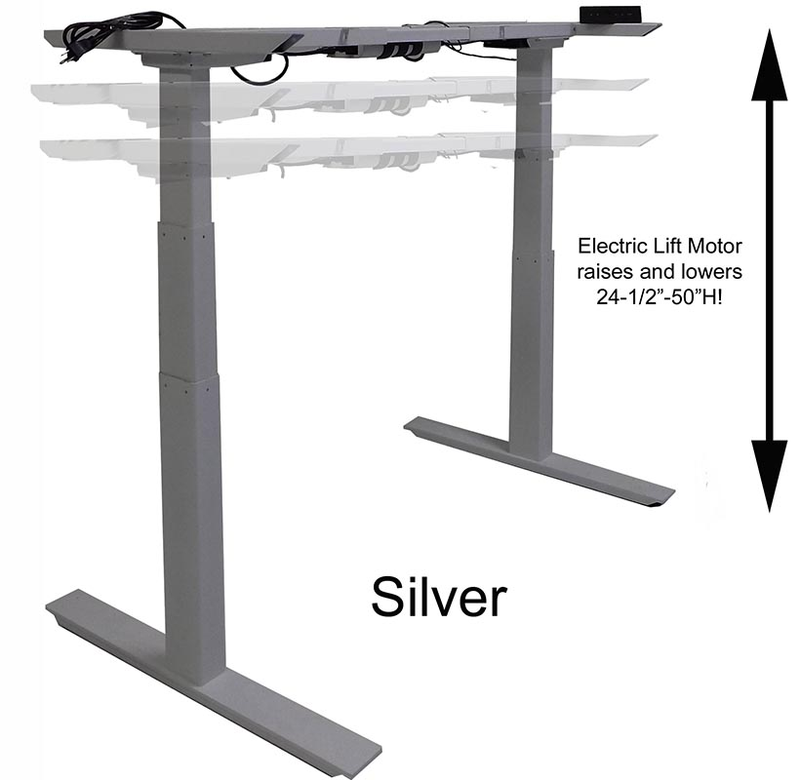 Our electric lift height adjustable table base converts any table top up to 48" wide into an ergonomic, height adjustable work table! Worksurface height range is from 24" - 50" high! Price shown is for electric lift table base only. Table top not included. 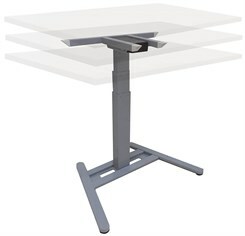 See our complete Adjustable Height Tables w/Tops here. Shipping weight 36 lbs. PRICE INCLUDES SHIPPING! IN STOCK! * 150 pound lift capacity! * Footprint measures 29-1/2"W x 22"D.
* Centered lifting column/motor for stable, even lifting. * Quiet and smooth lift motor. * LCD touch screen display with 4 position memory. Mounts in any position along desk top edge. * Easy assembly. Ships unassembled for safety in transit.